Here’s a very well crafted album, free from any identifiable faults, that most listeners will probably like. I tend to agree with Lester Bangs, providing context in a two-part review of The Stooges‘ Fun House for CREEM Magazine, that The Byrds and their ilk were really an obvious and direct electrified extension of acoustic folk of the early 1960s, and their attempts at genre crossover, like this album of country/rock, really presented a straightforward combination of the styles that would have inevitably been attempted by somebody at some point. They take proven elements from country and rock and set them side-by-side. The vocal harmonies sound like typical smooth, airy and Anglo-centric Byrds stuff, and the country material is all authentic twang. 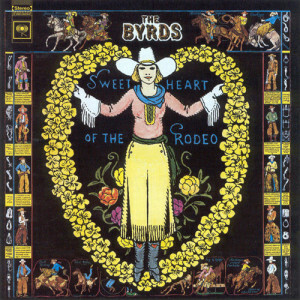 But even if the Byrds rarely take any real chances, you can’t really argue with the craftsmanship here. Tons of great old tunes and covers of contemporary country, folk and R&B too. If you are going to do the obvious, you can’t make any mistakes, and on that score The Byrds really deliver.